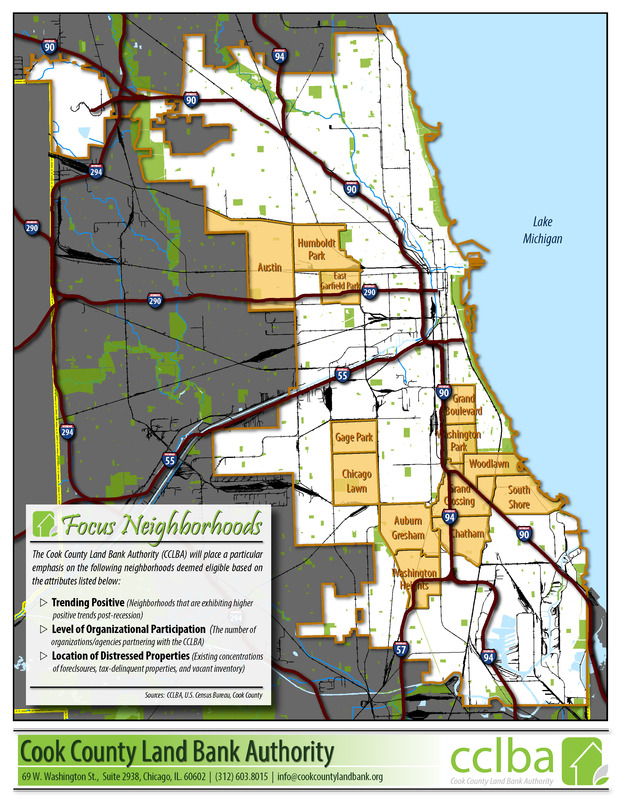 Consequently the CCLBA, with help from the DePaul Institute for Housing Studies, put together a study identifying thirteen (13) focus communities both in the suburbs & City of Chicago where substantial investment would provide the greatest positive impact. Further information on each community can be found below, and a copy of the presentation to the Board of Directors can be found here. * The study does not serve to exclude any communities within Cook County, but to prioritize where the Land Bank can devote greater resources given the CCLBA’s limited budget. The CCLBA is working with many partners outside of these focus areas, and we encourage you to get in touch with us if you are interested in pursuing opportunities with the CCLBA. 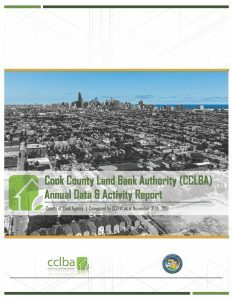 ** Municipalities that are in the realm of the South Suburban Land Bank Authority (SSLBDA) were not included in this study, however the CCLBA will be working in these communities under the direction of the SSLBDA. Screenshot of CCLBA’s interactive property viewer. Please click graphic to view all tax-delinquent parcels. Pursuant to Section 21-90 of the Property Tax Code, the CCLBA (acting as an agent of Cook County) has the ability to acquire tax-forfeited properties, extinguish the back taxes, and sell these properties for redevelopment. These properties are also available for viewing on an individual basis in the CCLBA’s Interactive Property Viewer. In order to view, please click on the drop-down menu to the right titled, “Layers” and scroll down to, “Tax-Delinquent/Scavenger Sale Properties.” From that point, click on any individual parcel in order to view the property address, last known taxpayer, parcel size, and total amount of taxes that are delinquent. The Great Recession flooded Chicago with foreclosures, deepening the blight in many of the city’s economically distressed neighborhoods. 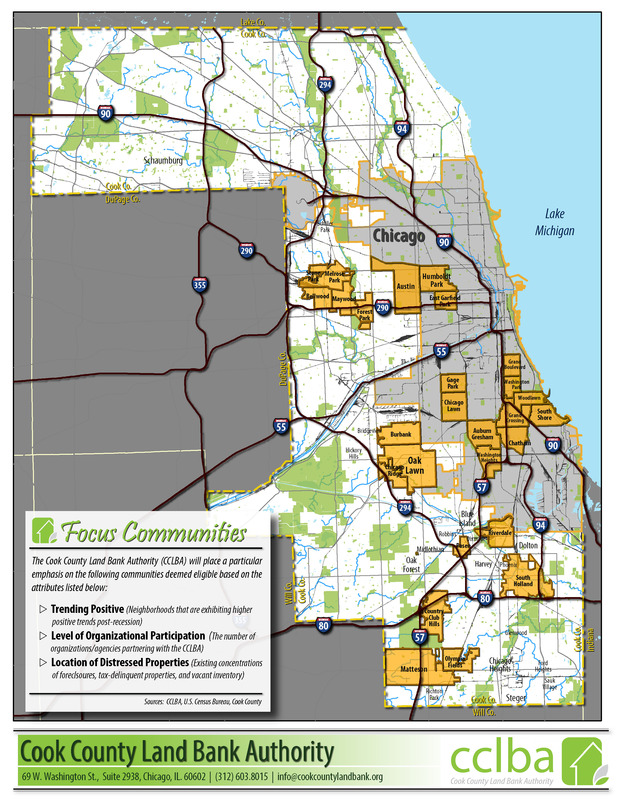 Nearly 10% of Cook County’s housing units are vacant, according to the least Census. 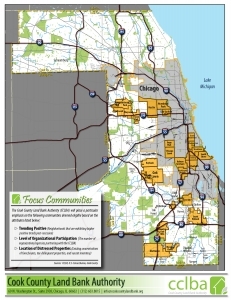 To turn the tide in these communities, County Commissioner Bridget Gainer and President Toni Preckwinkle championed the creation of the Cook County Land Bank, which was passed by the Cook County Commission in January, 2013. The land bank will return vacant and foreclosed properties to productive use – either as renter or owner-occupied housing, or open space. 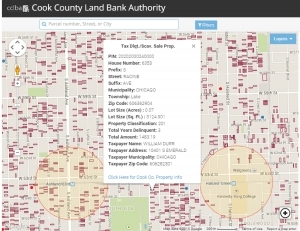 In partnership with the Institute for Housing Studies at DePaul University, we’re building a cutting-edge, open source analytics tool to help the land bank make informed policy decisions about which properties to acquire and redevelop. To do that, we’ll analyze Cook County’s real estate market and assemble data on property sales, foreclosures, building inspections, zoning, and much more.